Minnesota weather is notoriously harsh. Snow, ice, wind, rain and cold temperatures pound your roof day after day, month after month, year after year. Over time, it is normal for your roof to become vulnerable and need to be repaired or even replaced. You can generally expect your roof to last somewhere between 20-25 years. During that time, it is important to have a professional roofing repair and replacement contractor evaluate your roof periodically to ensure that it can continue to do its job effectively and protect your home. Refuge Roofing & Siding specializes in roofing repair and replacement for property owners in the Minnesota area. We are a GAF certified roofer, meaning that we are properly licensed, trained, certified, and insured. Only 3% of all roofing companies have this certification, so you can be confident when you partner with us, you will get the best customer service and high quality work. Our roofing contractors can install all types of shingles and can help you determine what will work best for your home or business. We can install architectural shingles, steel roofing, and cedar shake roofing. We can also offer our recommendations, based on what we have seen work best in our area, and given the size and location of your home. For example, the best and strongest asphalt shingle we have found is the architectural shingle. It is elegant looking and very strong, able to withstand the Minnesota elements. It offers a great look and protects your home like few others. Another very popular roofing option is cedar shake roofing, which can last up to 50 years. While some of the roofing options are more expensive, they may also last longer and provide much needed protection from the Minnesota weather. The bottom line is that our roofing contractors will help you choose the best possible roofing material for your home or business. And, if all you need is to have your roof repaired, we can handle that as well. We strive to satisfy our customers, will communicate clearly about the necessary repairs and pricing so that you know exactly what to expect. 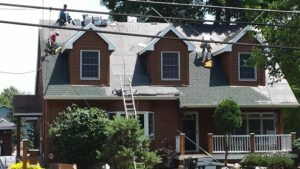 Our contractors are highly professional and have years of experience and will complete roof repair or replacement jobs with the care your home deserves. For more information or to schedule a time for a free roofing evaluation and quote, call us at (651) PRO-ROOF.